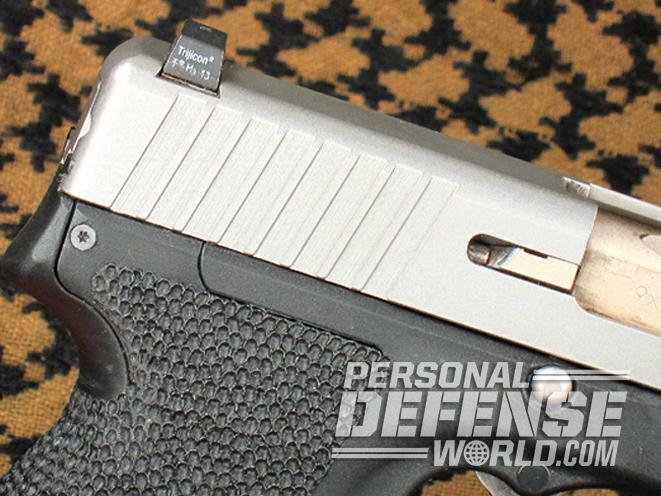 There are a range of pocket pistols available, and a few where custom work takes the game up a notch, like Cylinder & Slide's recent work with the Kahr PM9. 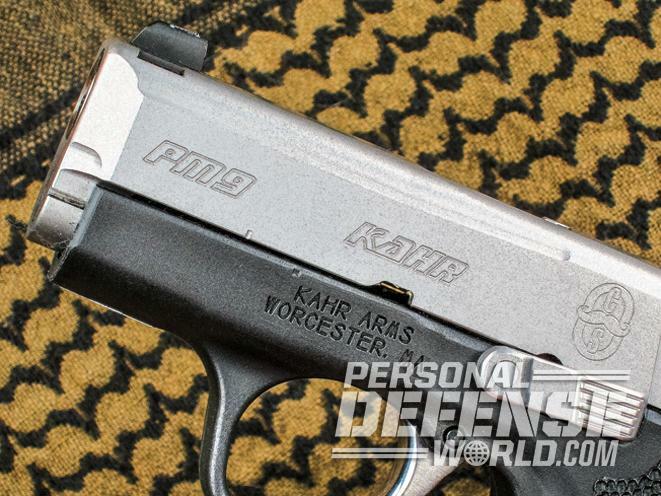 In the subcompact pocket pistol arena, the Kahr PM9 is hard to beat. But now Cylinder & Slide has taken it to a whole new level for everyday carry with an enhanced frame and much more. 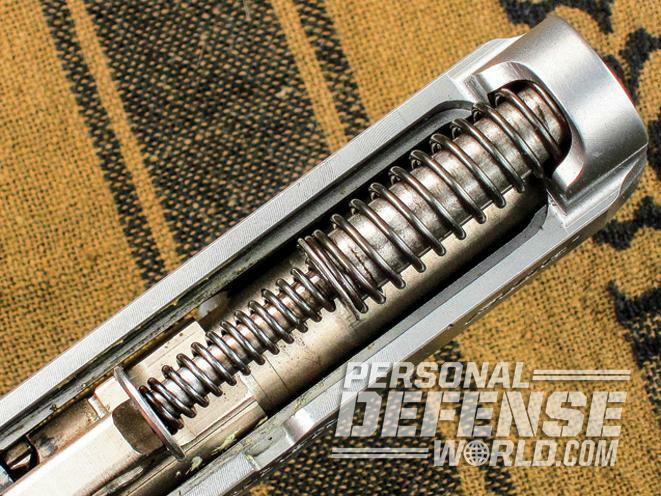 The PM9’s non-captive dual recoil spring assembly helps the subcompact pistol tame the 9mm recoil. 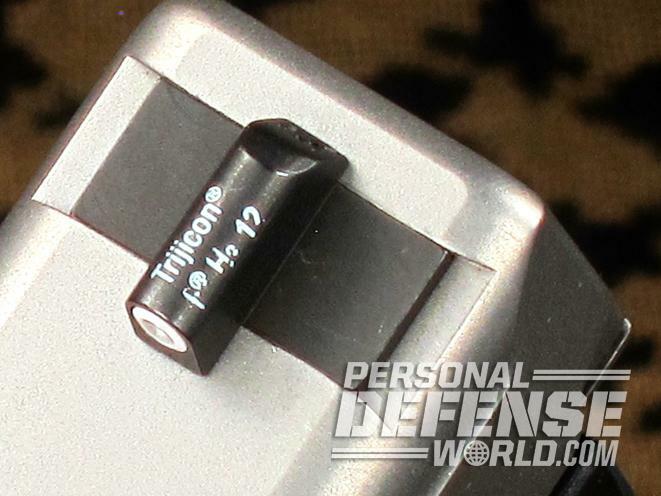 C&S customizes the barrel by giving the muzzle an 11-degree crown. Note the two-piece telescoping guide rod underneath the barrel. C&S bevels the slide-lock lever for smooth, snag-free draws. The trigger is polished for consistent double-action pulls. The XS sights are designed for quick acquisitions at short range. 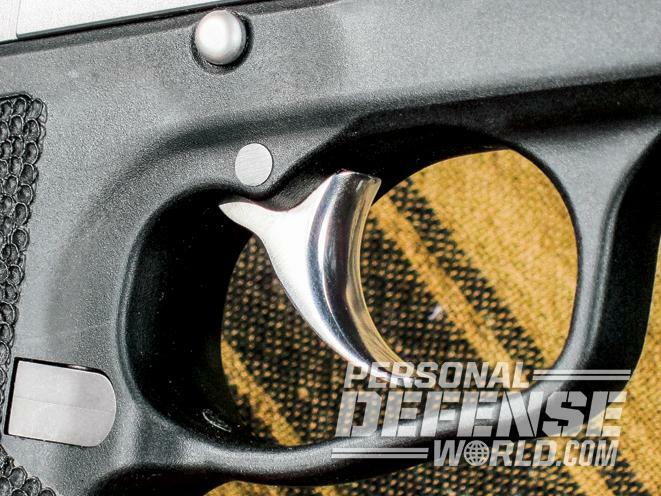 Pocket guns have a long and interesting history. While they originated much earlier, Henry Deringer made both a name for himself and an entire class of small handguns with his highly successful, single-shot percussion Philadelphia Derringer between 1852 to 1868, and the derringer label has pretty much become synonymous for any small one-, two- or four-shot pistol today. Cutback versions of revolvers have been popular since Samuel Colt’s time, and with a revolver’s ability to fire just about anything you can put into its chambers without malfunctioning, they can offer great reliability along with serious ballistics. 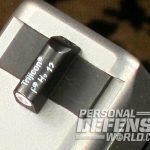 Underpowered loads will still function perfectly fine if necessary since the action is cycled by the operator, not the ammunition, and reliability isn’t affected in going smaller as it can be with an autopistol. 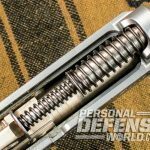 With a revolver, you can trim the barrel, abbreviate the grip and still stick to a relatively powerful caliber, all without having to re-engineer the frame or the relationship between slide mass and spring tensions, among other considerations that come with modifying semi-autos. 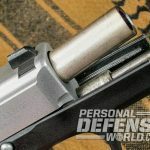 While it’s comparatively easy to maintain mid-bore power levels in a small revolver, the situation’s much more complex in an autoloader, where so much depends on the pressures of the caliber to simply operate the action. 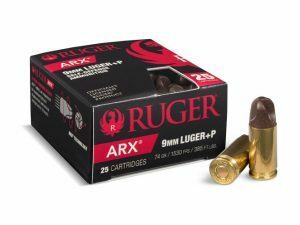 The challenges of balancing those pressures—cartridge lengths, slide mass, slide velocity, and magazine components—all combine to keep pocket autos (true pocket autopistols, anyway) confined to calibers like the .22 LR and the .25 ACP for many years, since those small frames limited power levels. Most were blowbacks, because it wasn’t easy to fit the locked-breech system of the more powerful full-sized pistols into such a tiny package. 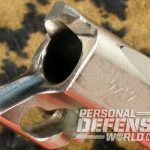 Chopped versions of bigger-bore semi-autos were tried with some success, like the highly-modified ASP version of the 9mm Smith & Wesson Model 39 in the 1970s, but those and other chop jobs were simply whittled-down versions of full-sized pistols. And while they offered some concealment advantages, they were still band-aid approaches and few were true pocket pistols by today’s standards. Various smaller-than-full-sized .32s and .380s followed in the 1970s and 1980s, which were a step up in power over the .22s and .25s, but most were still fairly bulky and needed a good-sized pocket to carry in. It wasn’t until the mid-1980s, with the explosion of “defensive” demands as a market-driver, that smaller designs (that began as smaller designs) started to emerge in the mainstream market. 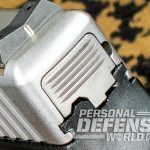 The spread of concealed-carry permits added to the tidal wave in the 1990s, when thousands of new carriers quickly got tired of trying to deal with heavy, full-sized pistols and the trend toward smaller pistols in “serious” calibers ramped up. Today, we have a great range of truly pocketable pistols to choose from, at various price and power levels, and we can even find a few where custom work takes the game up a notch, like Cylinder & Slide’s (C&S) recent work with the concealable Kahr PM9. 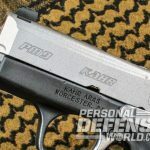 Kahr’s PM series debuted in 2004, as a lighter and smaller evolution of the company’s already compact line of pistols dating back to 1994. 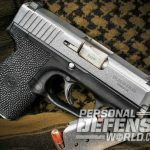 The PM models in 9mm, .40 S&W and .45 ACP use the same basic action of their all-steel cousins, with the same no-frills approach with fixed sights, black polymer frames, single-stack magazines, double-action-only (DAO) triggers and two-finger grips. Aside from their surprisingly small sizes for full-powered calibers, the PMs also feature a unique and reliable offset barrel/integral feed ramp design, allowing a thin frame cross-section and an equally surprisingly simple internal mechanism. With the ramp positioned left of center, this provides room to move the trigger draw bar closer to center on the right. 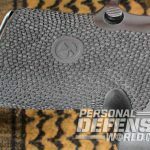 The end result in the version tested here is a slim, trim and entirely pocket-worthy 17-ounce 9mm package no thicker than 0.9 inches wide on the matte stainless slide, and 0.950 inches through the grip area. 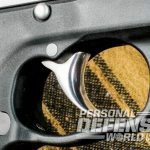 The PM9’s 3-inch barrel, overall length of 5.42 inches and 4-inch height from top to bottom with the six-round magazine inserted all add up to one of the smallest practical carry packages you’ll find anywhere in a quality-made 9mm pocket pistol. Other features that add up to reliable function include the dual-recoil-spring setup on a two-piece steel guide rod, an extractor claw that’s twice as wide inside where it grabs a case rim than it appears on the outside, a locked-breech Browning-style recoil lug, a passive internal firing pin safety and a steel mag-release button. 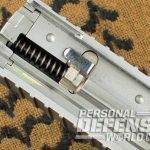 The PM9 also gets major bonus points for not having a single external safety anywhere on it, nor a single magazine disconnect anywhere in it. 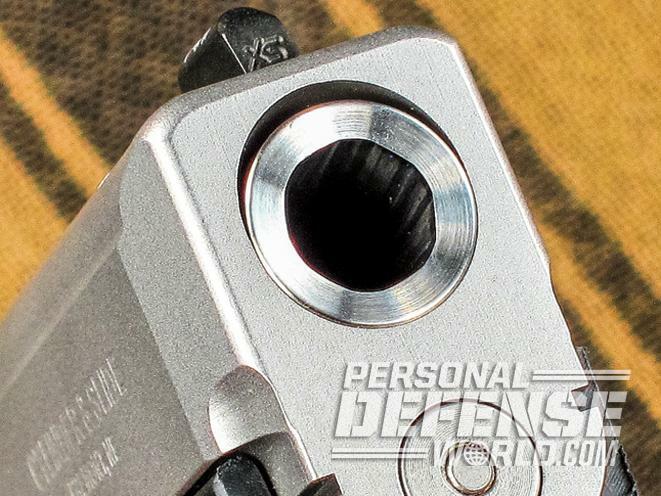 All in all, the Kahr PM9 is a very well-thought-out pistol, and that’s even before Cylinder & Slide gets to it for further enhancements and customizations. The sample that C&S sent for a trial run made quite an impression right out of the box. 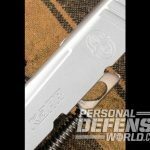 Besides the base features listed above, C&S had added its “Kahr Package 2.5” to make a good concealment pistol into an even better one. As part of that 2.5 Package, the PM9’s barrel was recrowned to 11 degrees and polished up front, and the chamber throat and feed ramp were polished at the rear. 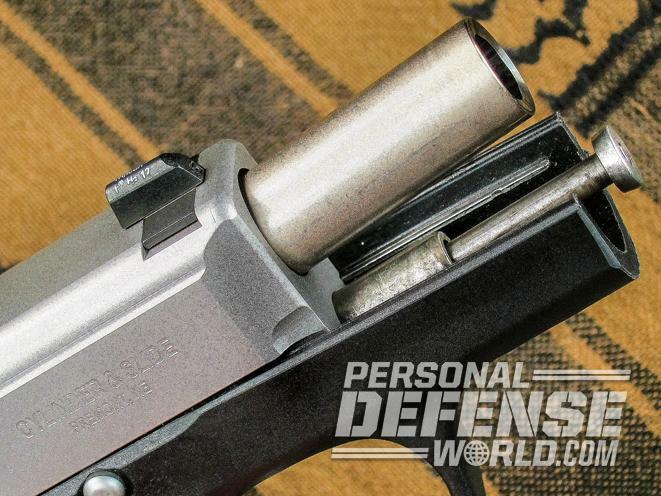 An action job was done to smooth up the internals, and to make sure the pistol was left with a smooth, 6-pound-minimum trigger pull for dependable ignition (anything lighter risks the occasional misfire). 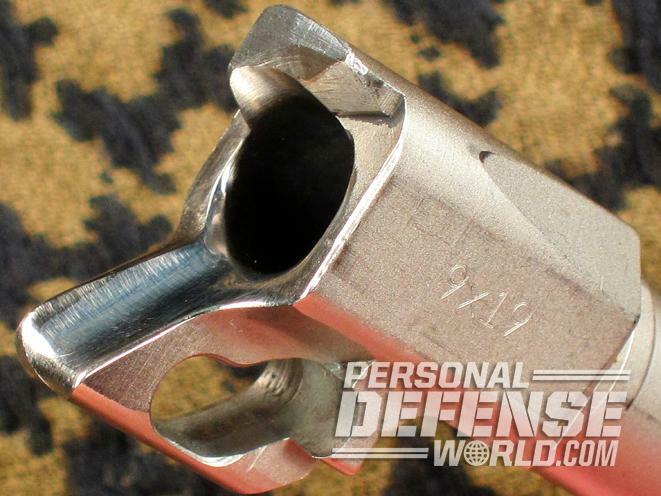 The extractor was radiused and tensioned for maximum efficiency, the ejection port was beveled for clean ejection, and the slide lock lever got a carry bevel. The trigger was also radiused and polished, leaving a near mirror-bright and rounded face with no sharp rear edges. Up on top, the original white bar-dot factory sights were replaced with a set of XS tritiums, with a very visible dot front over a wide, express-style, V-shaped rear. The frame deserves a paragraph of its own. What you don’t see at first glance is the chamfering around the mag button, done to make absolutely sure that button doesn’t bind in its hole on a mag-drop reload. The frame is modified internally to help it fall freely when the button’s depressed, and the mag well is also beveled for quick insertions. The frame work you do see at first glance is the precise 360-degree stippling done by hand, one indent at a time, with a soldering iron. 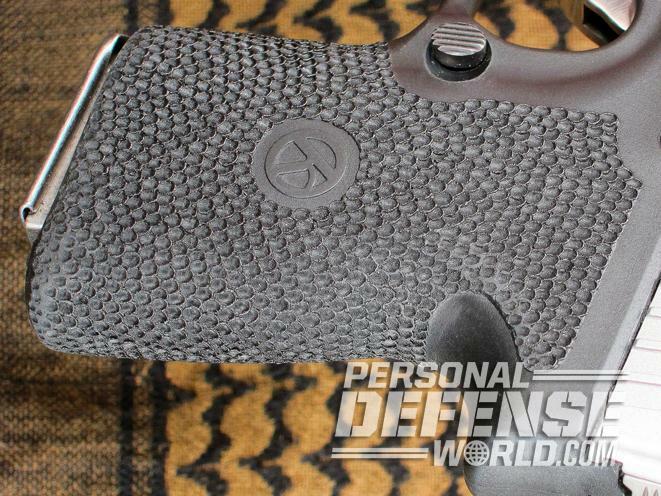 This stippling is well executed by someone with a good eye, a very steady hand and a heck of a lot of patience. The little blaster came from C&S with small grease dabs in strategic spots, and just for extra insurance I swabbed some FP-10 lube on those and key barrel areas before heading to the old quarry for a workout with the PM9. 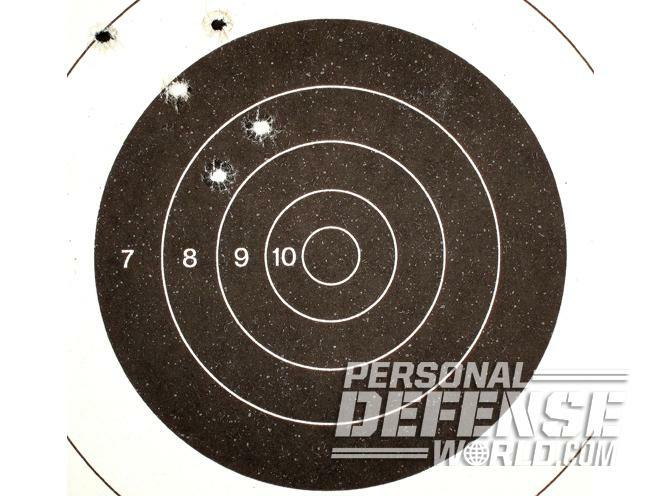 Once there, I tested four loads covering three bullet weights off the bench at 15 yards. 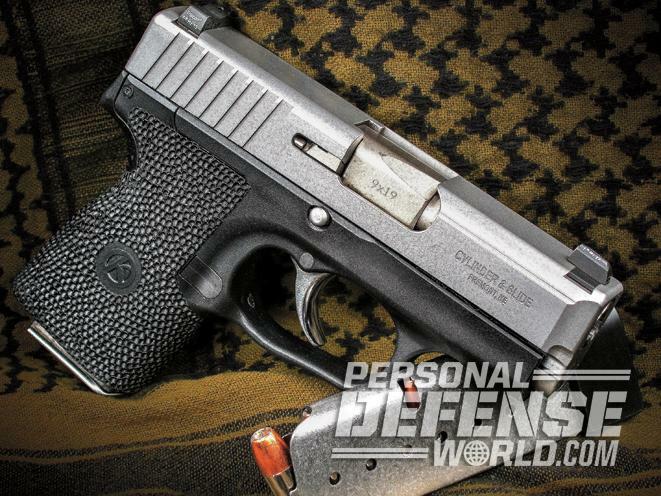 I’d asked C&S about ammunition sensitivity, sight regulation and expected accuracy—the answers were “none,” “15 yards” and “1.5-inch groups on average, usually twice that with the XS Sights.” And during testing the Kahr fell right in line. 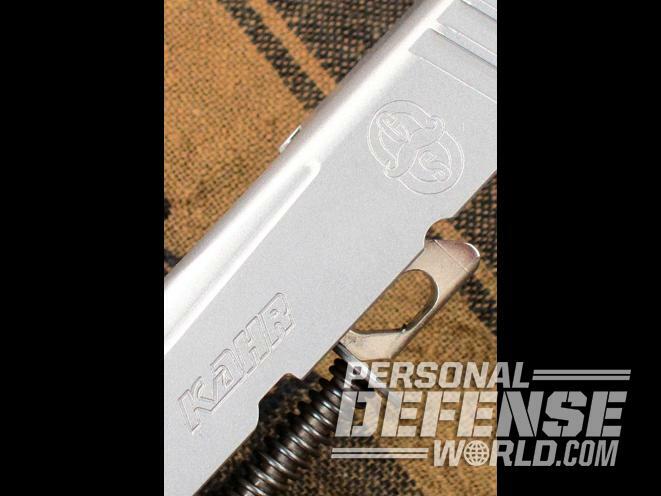 Kahr’s manual recommends a 200-round break-in period before the PM9 should be considered road-ready, and the sample hummed right through all four bullet weights, and both FMJ and JHP bullet types, without a single malfunction of any type whatever. Considering the balancing act that goes into reconciling 9mm pressures with such a small platform, that’s impressive. 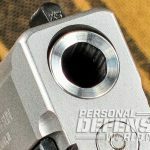 Accuracy-wise, the sights are designed for a right-now pickup, not leisurely, slow-fire target competition, and they do what they were intended to do. 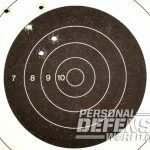 Best five-shot groups all held under 3 inches, and here I found the point of impact was a shade high and left when aiming with the dot centered inside the 5.25-inch black bullseye I use for pistol tryouts. The windage could be corrected by tapping the rear to the right slightly; the elevation wasn’t far enough off to worry about. 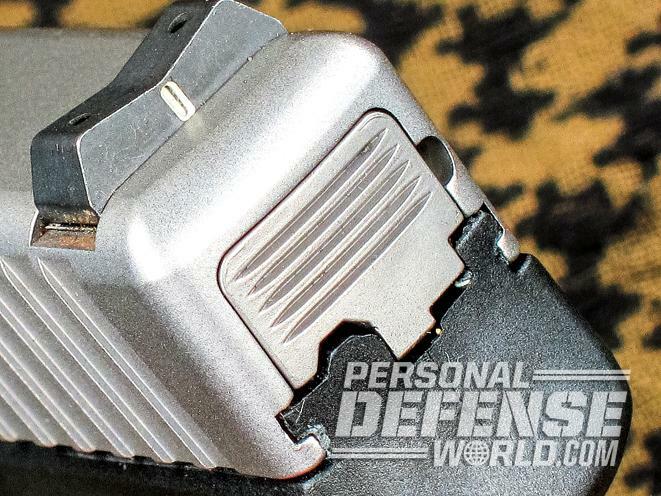 Emptying full mags on speed dumps, controlling the pistol was far easier than expected with the standard six-shot magazine, and the extended seven-shot mag gives a full three-finger hold for an even better grip. Overall handling was unexpectedly easy. The recoil levels with all four bullet weights were no heavier than several .380s I’ve spent time with. The pistol was not at all hard to hang on to, though the stippling does add up over a longer session, but it wasn’t abrasive enough to be seriously annoying. 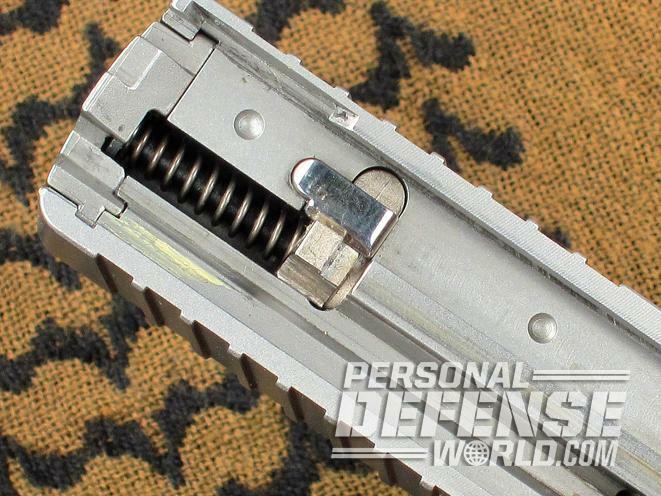 The no-second-strike DA trigger pull is long but very revolverish and easy to run, and unlike some designs a fully loaded mag is easy to seat with the slide forward. Everything added up to one extremely handy little pocket pistol that goes well beyond any comparably-sized .380 in power, if not capacity. 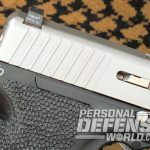 I can see why C&S chose to add this Kahr to its stable of regular offerings—when compared to the rest of its class it’s that good. The package described is $1,810 if Cylinder & Slide supplies the pistol, or $900 if you supply your own. Initial offerings will be chambered in .380 Auto, 9mm Luger, .40 S&W and .45 Auto.